This is my first time testing and reviewing a Private Reserve ink and so I feel a little bit like a pioneer exploring new lands. I bought a sample of this ink partially attracted by the name, Electric DC Blue, which hinted at a more unusual shade of blue. I will admit that the name is a bit misleading, but read on to find out why. I had a hard time finding out where Private Reserve inks come from but apparently they are manufactured in the US, in Indiana. That's cool to know. I had no idea that there were other US manufacturers apart from Noodler's. I tested Private Reserve Electric DC Blue in my trusty Pilot Varsity which I use every day at work. Private Reserve bottles have a capacity of 50ml / 1.7oz and this particular ink is $8.75 per bottle or $0.17 per milliliter. A very affordable price. Electric DC Blue hints at something more vibrant, perhaps even similar to Baystate Blue, but the ink is actually a somber navy blue, I would almost call it blue-black. It features fairly high saturation, but I see nothing "electric" about it, whatever that means. Because Electric DC Blue is darkish, you will be forgiven to believe that it doesn't have any shading. In fact it does, but it's very subtle. The q-tip sample shows what I'm talking about. Under the correct light I can also detect a very faint red sheen, almost like Diamine Midnight Blue but make no mistake, you won't see this in normal use. There is no feathering that I could discern. On Rhodia, as usual, Private Reserve Electric DC Blue does not bleed through at all. On a fresh sheet of photocopy paper it doesn't bleed either but there is some slight ghosting, perhaps in large part due to the darkness of the ink. I have noticed that this ink likes to be absorbed by paper so if you use poor quality paper then you will see some bleed. That is especially the case with paper that has been laser printed on one side. I use such scraps for random notes, at work, because I like to get as much use out of paper as possible. In this case, the paper is rendered more absorbent by the heating process of the laser printer and the ink tends to bleed liberally. I'm perfectly ok with that though. I generally like inks that permeate the paper. Electric DC Blue flows very well and was quite wet in the Pilot Varsity. It also felt well lubricated on paper, where it glided effortlessly. These are all features that I appreciate very much in an ink. The drying time on cheap paper is quick, once again, due to the ink being absorbed rapidly. On Rhodia the situation seems reversed. It took over 30 seconds for the ink to dry completely and not smear. It looks like the more higher quality (and coated) the paper is, the longer it takes for DC Blue to dry. That's pretty much inline with most inks, so no surprise there. This is by no means a waterproof or even water resistant ink. I found it interesting that the ink isn't washed away immediately when exposed to flowing water. It took me a little over a minute of holding under a running faucet to cause it to run, and it did so gradually. If you dunk it in water and hold it there then you will lose whatever you had written, but if you get some water on it by accident you might still be able to save it by drying the paper right away. Just don't wipe the water off, or you might also remove the ink. 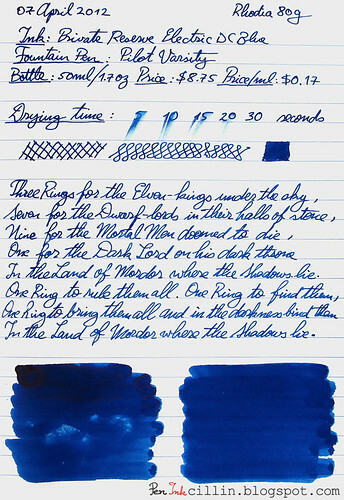 Electric DC Blue is my first foray into Private Reserve ink territory. It has been a pleasant experience, with a very well-behaving ink. The pen felt very smooth when writing and this is something that I hold very dear. I especially appreciate a greater-than-average wet ink because I like to see the sheen of wet ink on paper after I write. The one little flaw (if you can even call it that) of Private Reserve Electric DC Blue is that it prefers more expensive paper but this wasn't enough for me to dislike it. Overall, a solid performer. Next, you can see the two samples on photocopy and Rhodia 80g paper, respectively. This ink does look quite dark when used with a fine to medium point pen with good flow. With a bit lower flow rate and a broader nib (e.g. ~1.2mm stub) this ink is just "pops" off the paper, and can actually show a bit of shading! I have noticed some feathering on copy bond paper with fine to medium nibs in high flow rate pens. But probably due to the relatively quick dry-time, there's little bleed or show-through. I totally agree that this ink is not water-proof at all. In-fact if you like an ink that may actually wash out of your clothing, this one is a good candidate. As for lubrication, I would consider this ink to have medium lubrication, which is surprising given how saturated it is. In comparison... For around the same price in 60ml Namiki-branded bottles and (harder to find) 70ml Pilot-branded bottles (same ink), the Pilot/Namiki Blue ink is a close match to this one, albeit with a little less saturation - which can be a good thing IMO. The Pilot/Namiki blue is better lubricated. Finally the Pilot/Namiki blue smells Wonderful! PR DC Electric Blue has comparatively no odor at all. I was rather unimpressed with the 30ml PR packaging. The mouth of the simply cyclindrical bottle is wide enough, but there's no mechanism to act as a filling resevoir. The cap liner is coated paper :-( which I see far too often. In contrast the both the Pilot and Namiki bottles are beautifully designed and have a plastic ink resevoir insert that works very well. 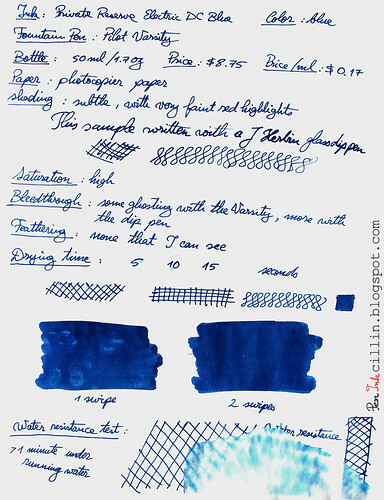 Needless to say, when I turn to an ink like this (which I often do), I usually pick up the Pilot/Namiki stuff. No, I don't work for Pilot/Namiki - I just love their blue ink. Hi David and thanks a lot for your input. That's a very concise review right there!